On Thursday, the University of Texas Board of Regents approved the financing for a $175 million south end zone renovation project, which will feature premium seating, suites, and renovations to the Moncreif-Neuhaus Athletic Complex, among other things. Construction will start in June of 2019 and wrap up before the 2021 season. The project will be funded by monetary gifts and revenue financing system bond proceeds through ticket sales and donations. Texas Athletic Director Chris Del Conte has already raised $80 million. Moncreif-Neuhaus will undergo yet another transformation, this one centered on player performance, medical, and rehab. Texas will also revamp their coaches' offices. As for the seating, think of the Horseshoe in Columbus, but with a giant jumbotron, and terraced club seating. Texas will also run through a tunnel surrounded by field-level suites, a la AT&T Stadium in Arlington and a recruiting room. 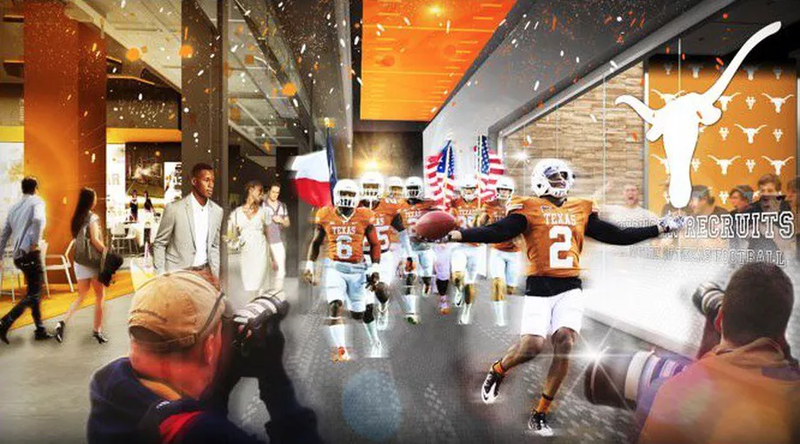 If the previous renovations to the locker room and weight room brought Texas equal to its peers, this project promises to put Texas among a very small group of elite programs in the country. For years Texas played into an open, south end. Eventually, the school installed bleachers in the south end zone for student seating. After the north end zone expansion finished in 2008, the South end zone was the last piece of the puzzle. Now Texas completes the vision for the stadium. If you're wondering what Texas can possibly do build/rebuild next, perhaps it's a new indoor facility and restructuring of its practice area. Lord knows they have the money. Posted on August 9, 2018 by The Roundup and filed under Southwest Round-Up, Texas and tagged DKR Memorial Stadium Facilities Roundup Chris Del Conte Texas Longhorns.